Update: From May 2012, the Market is closing for winter. It will start again in October 2012, keep an eye on www.peoplesmarket.com.au for re-opening dates. The Docklands precinct is about to become host to a new market concept. Part flea market, part farmers fair, and part hawker market, the weekly Melbourne Flea is launching on Saturday March 10 with a mission to bring a dynamic and hip community feel to Docklands. The currently deserted western end of New Quay will be transformed into an open air market that uses redesigned shipping containers to host retail and pop-up restaurants. A farmers market will occupy over 70 stalls, offering organic and home-grown produce, and the rest of the site will be taken up by a flea market, with over 100 stalls selling pre-loved clothing, furniture, arts and crafts. 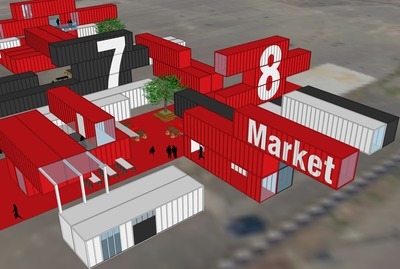 The market's developers have worked with local architects to tailor old shipping containers to specific retailers and restaurants, providing some design flair and creating a focal point for the market. As you would expect with Melburnians' educated palates, food will be a big drawcard and each weekend chefs from around Melbourne will create pop-up restaurants in the shipping containers, giving visitors the chance to sample an eclectic range of dishes. The variety will include artisan breads, Aussie standards like burgers and sausages, and multicultural offerings of quesadillas, dumplings, tacos and a Spanish BBQ. For many, the true test of a good market is the quality of its pre-loved fashion, and the Melbourne Flea is promising to cater to savvy second-hand shoppers with a dedicated vintage fashion section. The Melbourne Flea will run each Saturday throughout the year, starting at 9am with the farmers market open until 2pm, the flea stalls open until 4pm and the container retail and restaurants open until 9pm. It's accessible on public transport via trams 86, 70 and 35 (the City Circle tram) down Docklands Drive, and car parking is available near the site. If you want to get in on the action, you can register for a stall. It's $35 for a flea stall, and $75 for a spot in the farmers market.